March, a month of endings, is upon us. It was a year full of pleasant surprises and shock at how fast the children grew up. First of all, on behalf of all of the teachers here, I would like to thank you, as parents, for all of your support and understanding this year. The senior students will graduate this month and be elementary school students in April. It will be a marked change for all of them. In most cases, they have spent almost three years with the same classmates, getting to know their names, faces, likes and dislikes, as well as studying things like music, swimming, and English together. I would like to think they fostered trusting relationships over all this time. Moving on to elementary school will mean meeting all new people. They might make friends that they can’t communicate with easily. Another big difference will be class style. Will they be able to listen to and process the information from a teacher facing the blackboard, as opposed to activities introduced by the teacher? I’ve been told that things like that, along with walking to and from school, the change of environment, and having a rigid daily schedule are giving children trouble in the transition to elementary school. 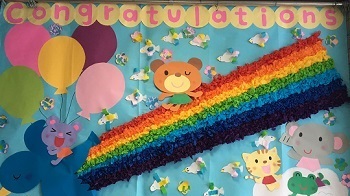 In the past, our principal Koetsu Sugawara put forth to parents the concept of “hatching” with regards to graduation and children moving up a grade. He meant it in the sense that a baby bird would tap the egg from the inside, alerting their parent who would tap the egg from the outside. Together they must work together to extract the baby bird from the egg. The same can be said of raising a child. If the parent cracks the shell too early, or pushes their child to develop too much, it can be dangerous. The same goes for missing signals children give as well. I hope you can take this concept to heart as the children move on to new schools and challenges. Next year, year 30 of the Heisei calendar, and a change in educational policies. The elementary educational programs are being skewed towards “ability” over “things studied”, and a move to more well-rounded development. We here at IYK are going to make strides in stressing the development of latent skills, and better personalities. Next year we can’t wait to provide an educational environment full of variety and new experiences. We look forward to serving you.